The iPhone has a default screenshot function, like any other decent smartphone, but it is limited. It only captures the visible screen and nothing else so if you’d want to capture any kind of scrollable area, you would need a third-party tool for the purpose. There’s also the option of taking several screenshots and stitching them together but this is hardly ideal. A simpler solution for those who own jailbroken iPhone is a tweak called BigShotJb. The BigShotJb tweak works in a simple manner – it takes a screenshot of an app’s scrollable interface. It works in various apps and system screens, and it’s just as easy to use as the default screenshot function. You can find the BigShotJb tweak available for free on Cydia. After you install it you can simply shake your device to grab a screenshot of the whole interface. Once the screenshot is saved, you will see a notification. 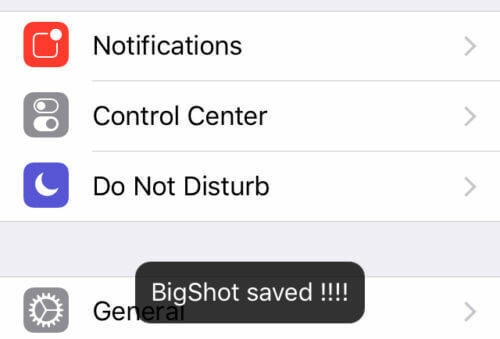 BigShotJb tweak automatically saved the screenshots to the Camera Roll. Obviously, from there you can edit them like any other image, as well as crop and share them via all iOS supported channels. For the most part, the tweak works perfectly. However, sometimes it cuts off the bottom of the screenshot, and there are also some problems in Safari every once in a while. Nevertheless, considering BigShotJb is free and it works most of the time, it’s still a worthy screenshot tool if you need to take scrolling screenshots often. Have you tried BigShotJb yet? Share your thoughts in the comments section below. Share this post if you liked it and follow us on Facebook,Twitter and Google+ to stay up to date with the latest apps, games, guides and everything Android, iOS and Windows Phone.